All Change at the Village Hall: Retirement of JOHN FIELD; John has worked tirelessly for the village hall for 18 years. He was Hall Manager for the old and new halls for about 15 years and then took on the additional job of Bookings Manager 11 years ago. The workload has increased considerably with the success of the new hall and a great deal of the hall’s financial success is due to John’s endeavours to maintain full bookings. Thank you John from the Village Association Committee and we wish you a long and happy retirement with perhaps a little more time to enjoy your bowling. Karen McCann New Bookings Manager for the Village Hall; When you telephone to book the hall in future, although the number remains the same, it will be Karen’s voice you will hear. 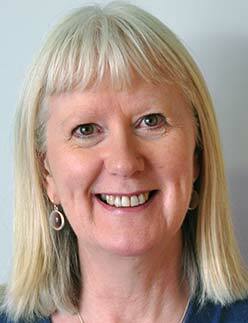 Karen will be taking over from John Field when he retires at the end of December. Karen has worked as Information Technology Manager in a London Borough Housing Department for many years so is used to sorting out complicated problems. In her spare time she enjoys walking and hiking and last year featured in the Village News and local newspaper when she took part in a sponsored walk to support ‘Maggies’ Cancer Centre attached to Hammersmith Hospital. We are delighted to welcome Karen to the Village Association and hope she enjoys her new challenge. 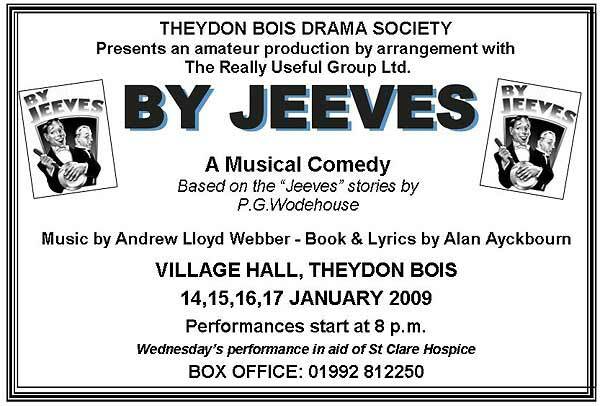 Theydon Bois Drama Society New Production: The Show - 'By Jeeves', a comedy musical by Alan Ayckbourn/Andrew Lloyd Webber. Dates - Wed 14th - Sat 17th January 2009. To note - the Wednesday performance will be for charity, with the ticket sales proceeds going to St Claire's Hospice, Epping. 'Bertie Wooster, a young man who seems to always be getting himself in to difficulties particularly with the ladies! , has his banjo disappear just as he is about to give a concert. His quick-witted and unflappable manservant Jeeves suggests that he entertain his audience by relating the hapless romantic misadventures of his circle of high-society London cronies. Various people are now co-opted as "actors" to assist in the re-enactment, and thus an impromptu theatrical extravaganza unfolds. At - Theydon Bois Village Hall, Coppice Row, Theydon Bois, Essex. Performances start at 8.00 pm, £8 a ticket. Spanish Connection in December Village News: As well as the usual wide range of articles of village interest the latest December 2008, issue of Village News has an item on the Basque Children in Theydon Bois in 1937, at the time of the Spanish Civil War. 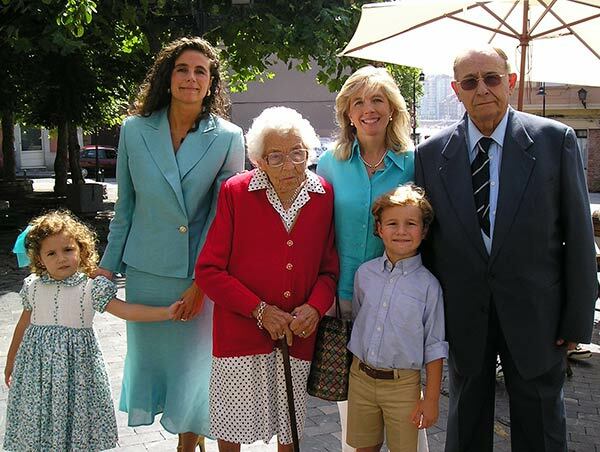 This article came about when recently our Village Website Editor had an e-mail from Covadonga Cienfuegos-Jovellanos a Spanish lady who works as a lawyer in San Sebastian, a lovely city by the sea, in northern Spain. Between May 1937 and February 1938 her father, Vicente Romero had spent 10 months in Theydon Bois together with his brother Jose Lois, sister Maria and 18 other Spanish Basque children. Covadonga was hoping that we could help her with more information as she was planning a birthday surprise for her father who was going to be 85 on the 4th December 2008 and still has fond memories of his time in Theydon Bois. With help from Ted Martin and Stan Newens of Loughton Historical Society we were able to research and find a lot of background information and pass this to Covadonga in Spain. The article in Village News is edited down because of available space, but Ted Martin is preparing a longer article, which will appear in their Society's Newsletter and soon be available from their website. Covadonga's father was unable to drive from Gijon (in Spain where he now lives) to San Sebastian for the birthday party because of bad weather, so she is now planning a Christmas surprise instead, which may include some copies of Theydon Bois Village News if we can get them from our printers and onto Spain in time. Be sure to checkout this article on pages 28 & 29 and if you are you old enough to have played with the Basque children in 1937 or do you know more about the children’s times in Theydon Bois? If so Covadonga, Vicente and Village News would love to hear about it. E-Mail: webeditor@theydon.org.uk or contact us via the Parish Office. EFDC have now extended the closing date to 6th February 2009. Theydon Bois Parish Council is trying to get this date further extended as not all villagers who have requested one have received their consultation document yet. The Parish Council believes that the consultation period should run for the original full length after everyone has received their document pack (you can request a paper copy of the document from EFDC here). We do now have a pdf of the consultation document for you to download and view. It is 7.5mb so we suggest you right click this link select Save As and save it to your PC. The errata document (correcting some errors, not all) is here. The questionnaire form is here. Further information related to the consultation document can be found on this EFDC page. Parish Council Meeting on Gypsies & Travellers Consultation: On Thursday 4th December the Parish Council held its second meeting to keep villagers informed about progress with the EFDC Gypsies and Travellers Consultation. 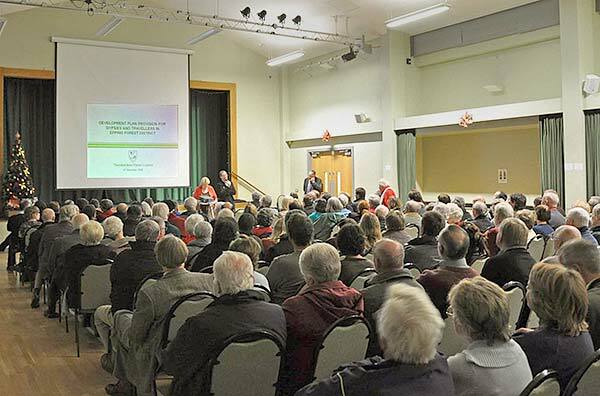 A packed, standing room only, village hall saw a presentation by Parish Council Chairman Sue Jones up-dating villagers on the all information that the Parish Council has at present and detailing the Parish Council's position regarding the consultation document based on this knowledge. Sue and John Phillip (both a Parish & EFDC councillor) then did their best to provide answers to villagers questions in a long question and answer session that followed the presentation. Sue confirmed that the stated Parish Council position with regard to the Consultation on Options is: Development Plan Provision for Gypsies and Travellers in Epping Forest District; the location of the proposed sites, 20b and 20c are unacceptable. Both locations are Green Field sites in the Metropolitan Green Belt; we would resist any relaxation of Green Belt policy that would allow any inappropriate development. Both sites border a Protected Lane, would be accessed via a dangerous unlit road and are too close to the motorway. Sue and John urged villagers wait before completing the EFDC questionnaire that accompanies the G & T consultation document as the Parish Council will be running some 'workshops' and giving advice on how to make the best response as soon as it can confirm dates with the village hall manager. Submissions to EFDC should try to identify in planning terms why these provisional sites are unsuitable as this will carry the most weight. The closing date for the consultation has now been extended to the 6th February 2009 and the Parish Council is urging EFDC to extend this further as many people have still not been able to obtain a copy of the consultation document. The Parish Council has confirmed that its aim is to work with and share information with all like minded groups within the village that are working to produce a meaningful detailed response to the EFDC consultation. It is encouraging villagers to e-mail them at the address provided by this website: consultation@theydon.org.uk with their concerns and ideas on how best to respond to the consultation. It is particularly interested in getting assistance from villagers with expertise in Planning, Legal and related matters, but all information is useful and will be shared with the groups unless indicated otherwise. The Parish Council aims to keep villagers regularly informed by Village News, Village Notice boards and this website. We hope to produce some specific information pages here soon. TBAG have also are aiming to keep villagers informed with news on their website. Other Local Action Groups with information websites on the consultation document are: Epping , Thorwood , Northweald and Waltham Abbey. You can contact your EFDC Theydon Bois District Ward Councillors for information and help via these email links: Roland Frankel & John Phillip . Our MP Eleanor Laing has opposed the consultation proposals in parliament and the Parish Council encourages you to e-mail or write to her; Eleanor Laing, House of Commons, London, SW1A 0AA. There is also a petition on the Number10.goverment website calling for a review of National and Regional Policy Requirements on Development Plan Provision for Gypsies and Travellers. In November Epping Forest District Council launched its consultation about the provision of sites for Gypsies and Travellers. The Parish Council was very concerned to see that two of the potential sites are within our Parish. The policy of Theydon Bois Parish Council with regard to the Consultation on Options: Development Plan Provision for Gypsies and Travellers in Epping Forest District, is that the location of the proposed sites, 20b and 20c are unacceptable. Both locations are Green Field sites in the Metropolitan Green Belt; we would resist any relaxation of Green Belt policy that would allow any inappropriate development. Both sites border a Protected Lane, would be accessed via a dangerous unlit road and are too close to the motorway. We are very aware of the concern shared by our residents about the impact this development could have on the Green Belt and our community. For this reason we have set up a dedicated email address consultation@theydon.org.uk for any resident to contact us directly. Please use this to contact the Parish Council about any aspect of the consultation. Do e-mail us with any questions you may have and share your concerns and opinions about the potential sites. Please also let us know about any expertise you may be able to offer to help us in our efforts to protect the Green Belt from this latest threat. 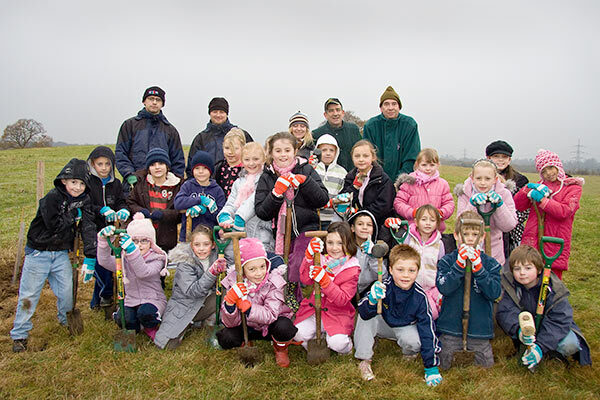 The pupils from Theydon Bois Primary School braved the wet and the cold on Wednesday 26th November to plant a hedgerow of trees along the top of Harewood Hill. Some instruction and assistance was on hand from members of EFDC Countrycare. Village Christmas Card Winners 2008: Every year the Parish Council in conjunction with Village News and this Web site challenge the children from our Primary School to produce a Christmas Card for our village. Each year the standard seems to get higher and higher making the judges task that much more difficult. 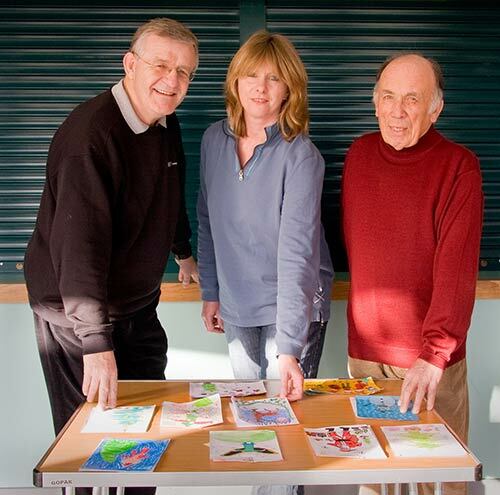 Judges: Tony Ames, Madeleine McCarthy & Trevor Roberts who together with Jim Watts selected this years winners in the Village Christmas Card Competition. The judges pick a winner and runner up from each class entry, then the Infant and Junior Section Winners and finally the Overall Winner. This year there were quite a few disagreements along the way because of the high standard, but the judges were unanimous in choosing the entry by Elise Bray of class 5/6F as the overall winner. The judges praising her combination of the village sign with the Christmas theme. You can see all the winners here. Parish Council Open Up General Business Meetings to Public: The Parish Council are now having General Business meetings, which are open to the public, These are in between the bi-monthly Council meetings, which have always been open to the public. We will be putting the minutes from these General Business meetings on to the web site as we get them as we at present do with the normal open council meetings. The Minutes of the October meeting are here and we will publish the dates of forthcoming meetings when we receive them..
Theydon Bois Action Group Web Site: You may be aware that Theydon Bois Action Group who campaign on Environmental and Green Belt Issues that affect our village now have their own web site. We have have now added this as a permanent link from our Links Page, so you can keep up to date with their news and progress. Coppice Row/Abridge Road/Coopersale Lane/Epping Lane/Loughton Lane have a weight restriction order of 7.5 Tonne. Please be advised that Essex County Council Trading Standards Officers are currently enforcing Heavy Goods Vehicles (HGV’s) weight restrictions across Essex, in addition to existing enforcement by Essex Police. Should you receive any calls or correspondence regarding breaches of weight restrictions by HGV’s in the West Area please direct the enquiry to Consumer Direct on 08454 040506. Details of vehicles suspected of breaching the restriction (including registration number and company details including telephone number if present). More Village Road Works: Essex County Council will shortly be undertaking kerb and carriageway works in The Green between POPLAR ROW and WOBURN AVE. The works involves the excavation and installation of new kerbs along the green side of the road and repairs to the carriageway. To carry out this essential maintenance works it will be necessary to have temporary road closure in operation for the duration of the works from Monday 10th November 2008 for 3 weeks. Vehicular access will be maintained for residences where ever possible but there will be times when all cars etc will have no access due to the nature of these works, but we would ask that vehicles are not parked on the road during the hours of work and apologise in advance for any disruption. A signed diversion will be in operation. It is inevitable that with this type of work that some inconvenience will occur. Should you require any further information with regard to the works, please do not hesitate to contact my Engineer. 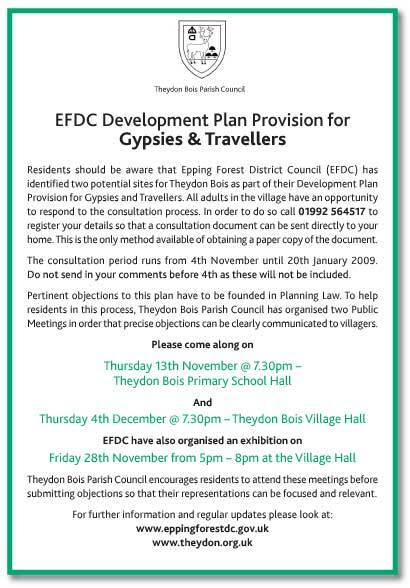 Given the concerns and importance after EFDC announced at a cabinet meeting their Development Plan Provisions for Gypsies and Travellers and the Consultation Document Theydon Bois Parish Council is circulating the leaflet below to all homes in the village. The aim is to encourage as many villagers as possible to attend both the announced meetings, as well as an EFDC Exhibition on the 28th November regarding the document. 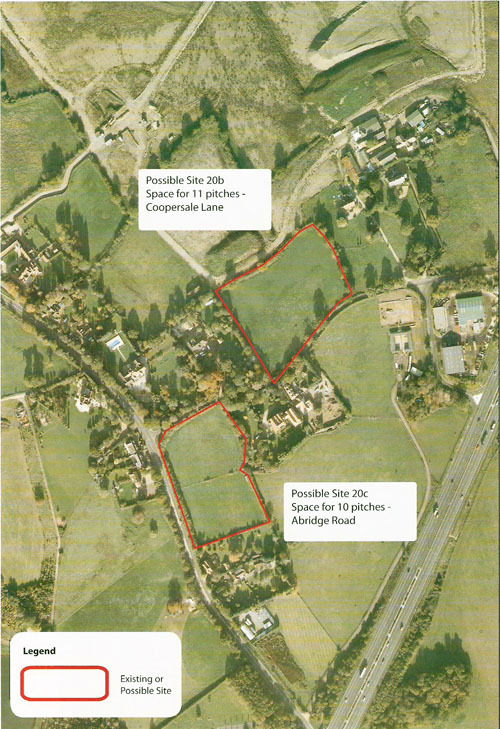 The document has identified two potential sites in Theydon Bois for Gypsies and Travellers as part of the EFDC Development Plan. The Parish Council meetings will discuss the implications should a Theydon Site be selected and aim to give guidance on how best to make individual representations to EFDC as part of the consultation process. The Rotary Club of Epping Forest: meets at the Queen Victoria, Theydon Bois at 7.15 pm every Tuesday. Recently we enjoyed a "South African" evening, with an interesting after dinner talk, a brief history of S. African, presented by the Proprietor of Queen Victoria, Henry Maasdorp. Henry's wife Lesley cooked a delicious traditional, South African meal for members and their partners. New members are always welcome, and more information can be obtained by telephoning President Nigel 01279 777133 outside office hours. We are a group of like minded people who have fun and try to support local organisations. We will be collecting for local charities in Epping High Street on Saturday 20th December 2008. Start the Christmas festivities; 4.00pm Christmas Eve at our annual joint "Carols on the Green" with the Choir and Band of St. John's Music School, everyone welcome. 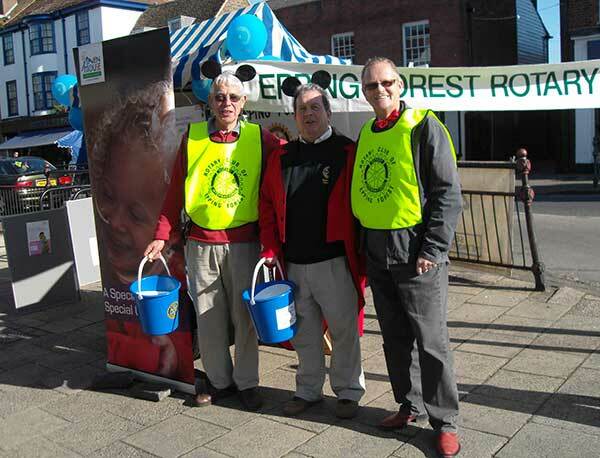 A recent collection by the Rotary Club of Epping Forest in Epping High Street raised £450.00 in aid of Children's Charities - Homestart, Haven House & Kids Out. Once again we would like to thank those who gave so generously. Gypsies and Travellers in the Epping Forest District: EFDC is currently preparing a 'Development Plan Provision for Gypsies and Travellers' document in order to meet the accommodation needs of Gypsies and Travellers in the Epping Forest District. This is going out for consultation – consultation period starts 4th November 2008 and ends 20th Jauary 2009 and an EFDC Council Meeting considered this consultation document last Tuesday 28th October. This meeting is now viewable as a WebCast. The consultation on options seeks views on, firstly, the strategy to be adopted for additional pitch provision in the District, and secondly potential sites which may be acceptable or otherwise depending in part on which strategy is chosen. The exhibition conected with the consultation comes to Theydon on 28th November and EFDC have booked the village hall between 5pm and 8pm for this. We are sure that many of you will wish to be present as it has already attracted a lot of local interest and concerns. If you can't attend the exhibition in Theydon Bois on this date EFDC is welcoming villagers to any of its other venues. If you have already written to EFDC prior to 4th November then your views will not be taken into account and you will need to write again as representations are only being considered if made between the 4th November and 20th January. Further information here or the EFDC Forward Planning Hotline will answer your questions, telephone 01992 564517. THEYDON BOIS SINGERS: will be holding a "CHRISTMAS CONCERT" on Tuesday 9th December at 7.45.p.m. at Theydon Bois Village Hall. Tickets £7 from any choir member, or on the door. Bar- Refreshments- Raffle for Charity. CAROLS TO JOIN IN AND SING. ALL WELCOME. Theydon Bois Men’s Forum: Our New Year season of Men’s Forum starts on Wednesday 12th January 2009. We have vacancies for new members and if you are free for a couple of hours on the 2nd and 4th Wednesday of months’ October to June then why not join us? We meet at Theydon Bois Baptist Church (rear hall), The Green at about 10.15 am and finish at 12 noon. Our selected and enjoyable talks given by invited guests take place in a very friendly atmosphere. If you would like to know more about the Men’s Forum please telephone either Vic Dowsett on 01992 814740 or Harry Memory on 01992 812696. More Village Road Works: Essex County Council will shortly be undertaking footway works in Forest Drive, on both sides of the road. The works involves minor kerb works and the resurfacing the footway with a new durable top layer. To carry out this essential maintenance works to the Footway there will be a certain amount of disruption to traffic from 8.00am till 4.30pm for 5 days from on or about Monday 3rd Nov 2008. Vehicular access will be maintained for residences where ever possible but there will be times when all cars etc will have no access due to the nature of these works, but we would ask that vehicles are not parked on the road during the hours of work and apologise in advance for any disruption. Village Road Works: Work on the lifting of existing granite kerbs and re-setting is currently underway in Coppice Row with the re-making of the footways to follow. In addition, Highways are due to re-plane the road between the shops up to the junction of Buxton Road in mid October with the re-making of the footways between the junctions of Buxton Road and Elizabeth Drive to be done in November. It has been agreed with Highways that the road “The Green” between Poplar Row and Green View Cottages will be completely refurbished in November. Wine Rack to become Undertakers? : The planning application for the former Wine Rack to be turned into a restaurant has had a change of use condition refused by EFDC and there is now a rumour that it may become and undertakers, but so far there has not been any new planning applications. New Dedicated Village Bench: The Wheeler family, who used to live in Green View Cottages on The Green, have agreed to purchase a bench with a plaque as a memorial to their parents and this is due to be installed outside the former “Wine Rack” in late November. on - Thurs 23rd - Sat 25th October 2008. 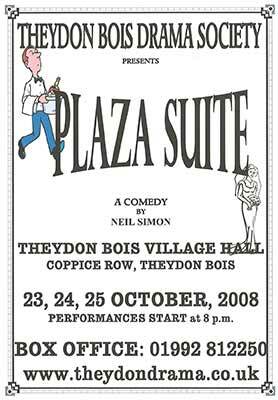 `Three different couples visit the luxurious Plaza Hotel and create a hilarious comedy in the process. Sam and Karen are returning to re-live their honeymoon from 20 years earlier but Sam has other ideas. Jesse, a successful film director has arranged to meet an old girlfriend to rekindle old times, but finds out she is married ....., and finally Norma and Roy have hired the suite for their daughter's wedding day but will the bride ever emerge from the bathroom she has locked herself in? '.